The Great Lakes Towing Company assisted the museum ship S/S COL. JAMES M. SCHOONMAKER Saturday, October 27 to its new slip at the future home of The National Museum of the Great Lakes. 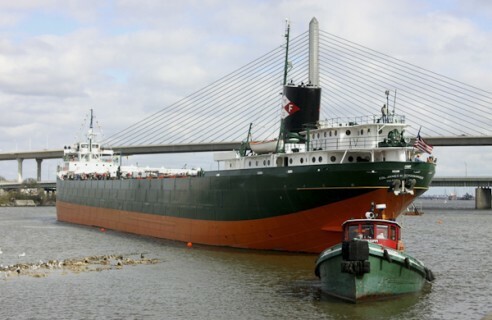 The Great Lakes Towing Company tugs NEBRASKA and PENNSYLVANIA towed the vessel from its previous location at International Park, Toledo, Ohio to its new location at the Toledo Maritime Center, Toledo, Ohio. The S/S COL. JAMES M. SCHOONMAKER is now docked alongside The National Museum of the Great Lakes, a new maritime history museum that is currently being constructed for its move from Vermilion, Ohio, to its new Toledo location. The Towing Company has had a presence in Toledo for over 110 years and donated its towing services to move the S/S COL. JAMES M. SCHOONMAKER to this new site. The Company has a long-standing policy of supporting Toledo, the Northern Ohio area, and the State of Ohio. This policy has a substantial economic ripple effect on state, county, and city businesses, governments, and communities. The Great Lakes Towing Company operates the largest fleet of tugs on the Great Lakes serving 40 ports and has been in continuous business for over 114 years. Company services include ship assist, logistics and cargo transportation, ice breaking, and emergency assistance of every kind of vessel, barge, and marine structure.